The love of boats and birds has followed him through life. Recently he renewed his interest when he at 89 years old ordered a new yacht specially designed for solo sailing. And 54 years ago, it was interest in boats that led him to becoming a customer at SEB, a bank Anders Parrow since then has been "completely faithful to.” He likes to visit the bank, but is also fond of internet and mobile banking, which "simplifies life enormously." “It is a huge asset to have a bank that you can trust. And it's amazing with the new tools for computers and mobile phone. I do not understand how anyone could handle their banking business without them”, he says. 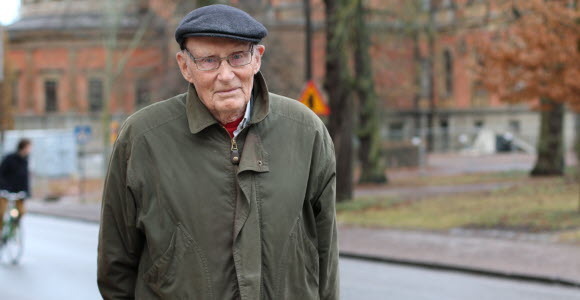 Anders Parrow, who turned 91 in the end of January, is very much present in the modern world and full of curiosity, enthusiasm and a lot of stories from an eventful life. Boating and bird-watching are two interests that have followed him since boyhood. However, he is not someone who posts the number of birds he has watched. Instead, it is experiencing nature that he is looking for. Therefore, one of the criteria when he ordered in the autumn of 2014 a new, easier-to-sail yacht was that it must be finished by mid-April when the Long-tailed Ducks gather in the coastal belt. "It's an amazing experience to hear their song in the early spring. I often say to the shipyard that as soon as there is a hole in the ice large enough for the boat they should put the boat in it". Anders Parrow grew up in Kalmar and after elementary school and grammar school; the plan was that he would go in his ancestral footsteps and become captain. But, when he signed on as a 14-year-old, World War II broke out and his parents asked him to come home because the sailor's life looked to be too dangerous. That became apparent when the boat he would have sailed on was torpedoed - although the crew fortunately escaped unhurt. Instead Anders Parrow chose a medical track, where he served as a consultant first in Uppsala and then for many years in Enköping. After he stopped working (which was long after retirement at 65), Anders Parrow has been able to devote more time to personal interests, travel and photography. The trips have ranged from Spitsbergen in the north to Antarctica in the south, and it's nature and bird interest which have been the driving force. Anders Parrows long and unbroken relationship with SEB began in 1962, when he wanted to realise his boat dream. He needed a loan and because previous bank did not dare to promise a positive response, he went to SEB, where the loan was granted without fuss. "I've had three people in the bank who have stood with me during this time, so there has been great continuity. Either everyone at SEB is nice or I have been very lucky". He has not had issues embrace innovations such as internet and mobile banking. However, he was also something of a computer pioneer in the medical profession. "I got a computer very early, but it was complicated and I had a hard time understanding it. I mentioned it to a friend and he said people over 60 years old should not get involved with computers. Then I was angry and went home and learned". He took his newly awakened interest in computers with him in the role of doctor and for a period Enköping was the only hospital in Sweden who had a complete record of both current and treated patients. So when it comes to banking transactions, Anders Parrow affirmed the new tools that the bank has developed. "I think it's great fun to visit the bank. It's always nice to meet my advisor Susanne. Most matters I take care of via computer and mobile phone, but if there is an issue, Susanne always gets involves and helps me".